We hired Morgan to paint our kids’ room in our previous house, that was about 5 years ago. The kids loved their murals so much. The murals became, along with Morgan, a part of our family instantly. The kids enjoyed the artwork in their room so much that we’ve decided to bring Morgan back to add the finishing artistic touches to our new home. Morgan is great to work with because she listens to what we are looking for and incorporates our ideas into the artwork. In each of our kid’s rooms, for example, she let our kids paint an element so that they will always remember that they played a part in the creation of their own mural. Morgan suggested that we try dry erase paint over the map, which we did. What a great idea. Now my son can write in the States, draw more pirate ships and anything else he can think of. The mural is totally interactive. It is absolutely awesome. I would recommend hiring Morgan in a heartbeat. She is a fabulous artist, she is easy to work with and she makes the whole experience super fun. Hands down, Morgan rocks! 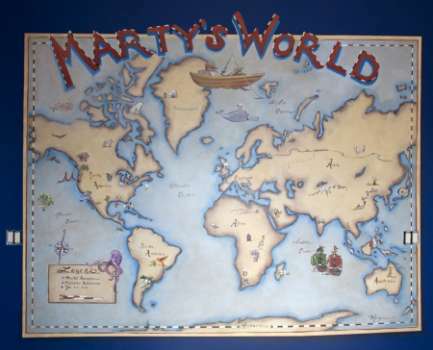 View detailed photos of this world map mural and other kids murals Morgan has painted.